Laurel Synder is raising her two sons Jewish, but not kosher. Editor's note: Laurel Snyder is a graduate of the Iowa Writers’ Workshop, a poet and author of many books for children. Follow her on Twitter at @laurelsnyder. (CNN) - A few years ago I was invited to my local Jewish Community Center to do a reading of my picture book “Baxter, the Pig Who Wanted to Be Kosher.” It was going to be a child-friendly event, so I took my kids along. Now, “Baxter” isn’t really a book about being kosher. It’s about wanting to be accepted into a community. But I always like to make sure my listeners know what the word kosher means before I read it, since the joke at the center of the book depends on that. So as usual I asked the Jewish Community Center crowd if they could define the word. Before anyone else could answer, my own son Mose, who was 5 at the time, jumped up and shouted out, “I know! I know! Kosher is us! We’re kosher!” Then he sat back down again, beaming proudly. And I might have been proud too. Only, you see, we’re not kosher. On the drive home I tried to figure out what to say to Mose about his mix-up. I wanted him to know what it means to be kosher, to live by a rigid religious dietary code, day in and day out. But I also needed him to understand that we’re not. How could I show respect for this part of our Jewish tradition while also suggesting that it doesn’t seem relevant in our own household? Should I just blame it on my own parents, who didn’t raise me that way? It’s not easy to explain something to a kid when you haven’t yet figured it out for yourself. One of the most helpful/terrible things about having children is that they require us to think things out explicitly. That often means they make us face the very things we’ve been avoiding. Sometimes, as a result, kids challenge us to become more mindful or observant. I hadn’t been a member of a synagogue for years when I became a mom. I hadn’t hosted a Passover Seder or found the time to light Shabbat candles. Even though I worked for a Jewish agency and wrote about religion professionally, when it came to my home life I was almost completely unobservant. Judaism was something I thought about more intellectually than personally. Religion was an interesting idea more than a belief system. Now I light candles each week and say the blessings. I belong to a havurah – a cohort of local Jewish friends who get together for monthly potluck dinners – and also a synagogue. But sometimes the opposite is true. Sometimes my kids help me recognize the limits of my faith. In truth, I do not keep kosher and I don’t really want to. My husband is not Jewish, though we’re raising our family to be. So, yeah, we eat tacos for Shabbat dinner most weeks and usually skip Friday night services. This is the truth and I have to own it. I can only shift my life around so much without feeling inauthentic. Lying to my kids about my religious life is no way to model the value of faith. So when, after the “Baxter”/kosher fiasco, I set out to write my new picture book, “Good night, laila tov” (laila tov means “good night” in Hebrew), I wanted to paint an honest portrait of my largely secular household. 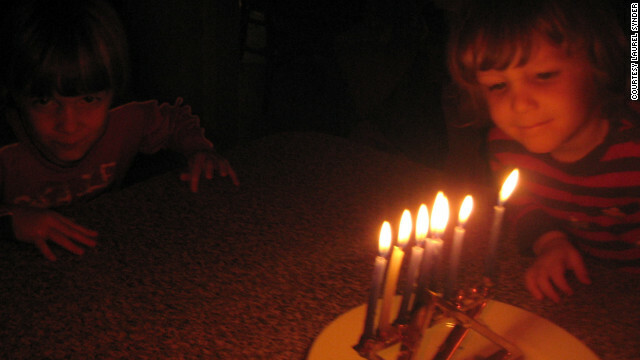 I wanted my kids to recognize the family in my story as Jewish, but also as, well, like us. Which is to say, not exactly kosher. On some level I was reacting to the fact that most of the Jewish picture books in my home feel like they’re about someone else. They’re usually set in a Polish village a century ago, or on the Lower East Side of New York City, where mothers cook and fathers pray. I wanted “Good night, laila tov” to be a sort of lowest common denominator. Contemporary and universal. It’s not about Jewish history, and it doesn’t have a single rabbi in it. It won’t teach you new Hebrew words or show you how to say a certain prayer. It’s just a story about a Jewish American family going camping, experiencing nature, love, work and rest. In writing it I hoped to capture something typical, something natural, something simple. And it does present, to my mind, Jewish values: Nature is spiritual, and takes us beyond ourselves. Time spent with family is sacred. The family in the book plants trees and picks up their campsite, because caring for the earth is part of Judaism, I think. Along with caring for each other. But as I wrote, I found myself a little afraid that, in attempting to write a picture book for everyone, I was letting the Jewish particularity go. Aren’t family nature, and environmentalism tenets of faith beyond the Jewish world, in every religion? What did it say about me, my choices, my household, that the Jewish life I was choosing to depict looked like it could be any household at all? Then I come back around to that moment with Mose, that moment of realizing I’d somehow misled him. Because whatever I’m unsure of, whatever I don’t know about faith, I do know this: if it isn’t honest, it doesn’t count. The opinions expressed in this commentary are solely those of Laurel Snyder. Thanks a lot for providing indldivuais with an extremely brilliant chance to read critical reviews from this website. It's always very enjoyable and jam-packed with a lot of fun for me and my office mates to search your web site on the least 3 times weekly to read through the new things you have. Not to mention, I am just actually fulfilled with the eye-popping creative ideas served by you. Certain 3 ideas in this article are clearly the most efficient we have all had. Don't you love how Protestants are always fighting Mormons, Catholics fighting Protestants, or they all hate on baptists, or what have you. "Lying to my kids about my religious life is no way to model the value of faith." Well said. If more religious parents thought like this, children wouldn't go through as much confusion.